Harper went 0-for-3 with a walk in Sunday's Grapefruit League game against the Yankees. Harper, who didn't play Saturday after getting hit by a pitch in the foot the day before, went hitless in his return to action (as the designated hitter). The outfielder is now 0-for-8 with a stolen base and 4:5 BB:K through five games this spring. 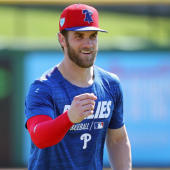 According to Matt Breen of The Philadelphia Inquirer, Harper is scheduled to play in a minor-league contest Monday before returning to the field Wednesday against the Tigers.